A team of experts located a fragment of the asteroid 2018 LA in the Central Kalahari Game Reserve in the southern African nation of Botswana. The asteroid fell from space on June 2, 2018, and the team found this fragment three weeks later on June 23. Meteorite hunters have recovered a fragment of a small asteroid that fell to Earth on June 2, burning up in the sky over Botswana just hours after it was detected hurtling through space. Now known as 2018 LA, the asteroid broke into several pieces after smacking into Earth's atmosphere, where it created a spectacular display as the "shooting star" blazed through the sky. Once it hit the atmosphere, the asteroid exploded and became what's known as a "fireball" meteor, creating a bright flash of light as it streaked across the sky. The first piece was found five days later by a group of geoscientists from local universities and research institutes in Botswana. 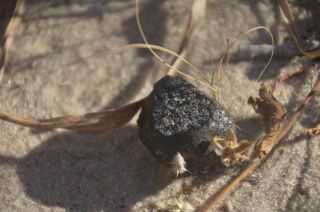 Then some international researchers from the U.S., Finland and South Africa joined the search and helped to recover a second piece of the asteroid in Botswana's Central Kalahari Game Reserve. Peter Jenniskens, an astronomer and meteor expert with NASA's Ames Research Center in Mountain View, California, and experts from the Finnish Fireball Network helped narrow down the search area by gathering footage from surveillance cameras in the nearby Botswanan towns of Rakops and Maun. "After disruption, the asteroid fragments were blown by the wind while falling down, scattering over a wide area," officials with the University of Helsinki said in a statement. By studying video footage of the fireball, the researchers could "get better constraints on the position and altitude of the fireball's explosion." These images show the discovery of asteroid 2018 LA by the Catalina Sky Survey on June 2, 2018. The asteroid hit Earth 8 hours after these images were taken, burning up in Earth's upper atmosphere over Botswana, Africa. The asteroid 2018 LA was first detected 8 hours before it hit Earth by astronomers with the NASA-funded Catalina Sky Survey near Tucson, Arizona. They determined that the asteroid was about 6 feet (2 meters) across. "This was a much smaller object than we are tasked to detect and warn about," Lindley Johnson, NASA's planetary defense officer, said in a statement. "However, this real-world event allows us to exercise our capabilities and gives some confidence our impact prediction models are adequate to respond to the potential impact of a larger object." Members of the search team that found a meteorite fragment from the asteroid 2018 LA point to the fallen space rock. The search teams plan to continue looking for additional pieces of 2018 LA that reached Earth's surface, University of Helsinki officials said. But they won't be able to take the meteorites home as a prize; because the meteorites are protected under Botswana law, they'll be taken to the Botswana National Museum in Gaborone, the nation's capital, where scientists will continue studying the samples.